Marcus Law insists Kettering Town’s focus is now firmly on building up match fitness ahead of the opening day of the Evo-Stik Southern League Premier Division campaign. The Poppies make the short trip to United Counties League Premier Division side Rothwell Corinthians for their opening pre-season friendly of the summer tonight (Tuesday, 7.45pm). And they do so having confirmed 15 members of their squad for the forthcoming campaign. Law has managed to retain the vast majority of his squad that finished last season as they just missed out on a play-off place. He is now ready to run the rule over a number of trialists including midfielder Nathan Hicks while he also revealed there is one unnamed player he is hopeful of bringing in to boost his squad. The new season kicks off in just over three weeks on Saturday, August 6 and Law believes his players will be relishing their first action of the summer when they take on a Corinthians team, now under the joint-management of Shaun Sparrow and Jim Scott. 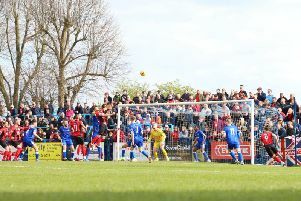 The Poppies boss said: “I said that the main aim was to try to keep everyone from last season and we have virtually done that. “There are a few trialists that we will look at in the games we have got coming up but the core of the squad is there and that’s pleasing. “We have got another iron in the fire with someone we are keen to bring into the club but he is keeping his options open so we will have to wait and see on that one. “But the main focus now is on really stepping things up and getting ready for August 6. “We have games galore to build things up over the next three weeks or so. “I am sure the players are looking forward to the first friendly. “We have had nine sessions over the past two weeks and now we can get out there and really start looking at things from a match point of view.